​Setting goals for the new year? We have one to add to your list: Keep your AC in good shape. It’s a worthy goal because when your air conditioner is working well, you have lower energy bills and higher comfort levels. Probably the easiest (and most important) thing you can do to keep your AC in good shape is to change your filters regularly. Less cool air coming from your vents: A dirty filter is basically a thick wall of dust that blocks air from entering your AC system. And less air into your AC system means less cold air that it can blow out into your home. Frozen evaporator coil: Limited airflow into your AC system causes the cold refrigerant to drop in temperature until your evaporator coils freeze, which also limits the amount of cold air that comes out of your vents. 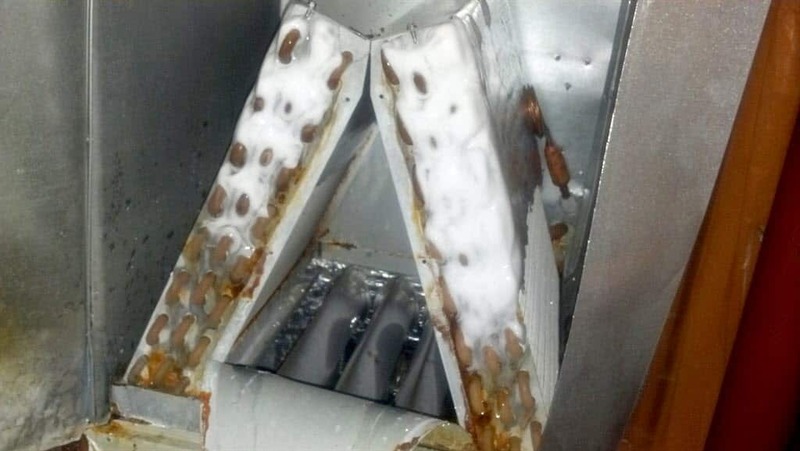 For more info about this issue, read our article, “Ice on Your AC? Why Your Air Conditioner Is Frozen and How to Fix It”. So, if your air filter ever looks dirty like the picture below, it’s DEFINITELY time to change it. But don’t wait until it’s clogged to take action. In fact, our suggestion is to check your air filter every 1-2 months and change it out even if there’s only a thin layer of dirt on it. Need help choosing the right air filter for your AC? Check out our air filter buying guide, or look into our Complete Care Plus plan, where we supply you with the right filter and change it quarterly for you. You’ll want to keep your outdoor unit free of debris and uncovered to keep your AC running efficiently. Here’s why: Your outdoor unit (also called the condenser) is responsible for taking all the heat from your home’s air and dumping it outside. But if your outdoor unit is dirty or covered by plants or outdoor furniture, all that heat can’t escape as fast, which means your system will run longer to cool your home. And if your AC system runs longer, you’ll have higher energy bills. Make sure you keep away debris from your outdoor unit. Even leaves or a thick layer of dirt, seen above, can decrease the cooling power of your AC. Your home most likely has duct leakage, which means wasted money. That’s because leaky ductwork makes your AC work harder than it has to. When your ducts are sealed and don’t have any leaks, it will make your AC more energy efficient and your home more comfortable. For more information about duct leaks and sealing, visit our duct sealing service page. Though it’s tempting to ignore signs that your AC needs repair, not taking any action actually costs you more in the long run. So if you smell something funny coming out of your vents, or hear strange sounds, don’t wait to call a professional to check out your system—even if you’re still getting cold air. Even if the problem seems miniscule- don’t wait. Small problems that go unfixed could lead to bigger ones, which will cost you more $$ and could lead to an early breakdown. And the LAST thing you want in the middle of summer is to be completely without cool air! Annual AC maintenance is essential to keep your air conditioner in tip-top shape. Think of it like changing your car’s oil. When you change your car’s oil regularly, your car gets better gas mileage and performs better. It’s the same with your AC. Maintenance increases your AC’s efficiency, which lowers your energy bills and prevents early breakdowns. We recommend you get an AC tune-up in the spring, right before cooling season comes into full swing. Visit our maintenance plan page to learn more about the tune-up plans we offer and read our article, “The Importance of a Complete Care Maintenance Agreement” for more info. Need AC help from a Florida professional? Whether you need a duct repair or you need help choosing the right air filter, we’ll help you get your AC system working efficiently. Do I Really Need an Air Conditioner Tune-Up Every Year?